You know how some women have a special dress tucked away in their closet? One they can’t quite fit into yet but they just know they will be able to wear soon? That’s where the idea for this shirt came from. We all have too many friends and loved ones diagnosed with cancer. With this shirt, you can show your optimism and support. 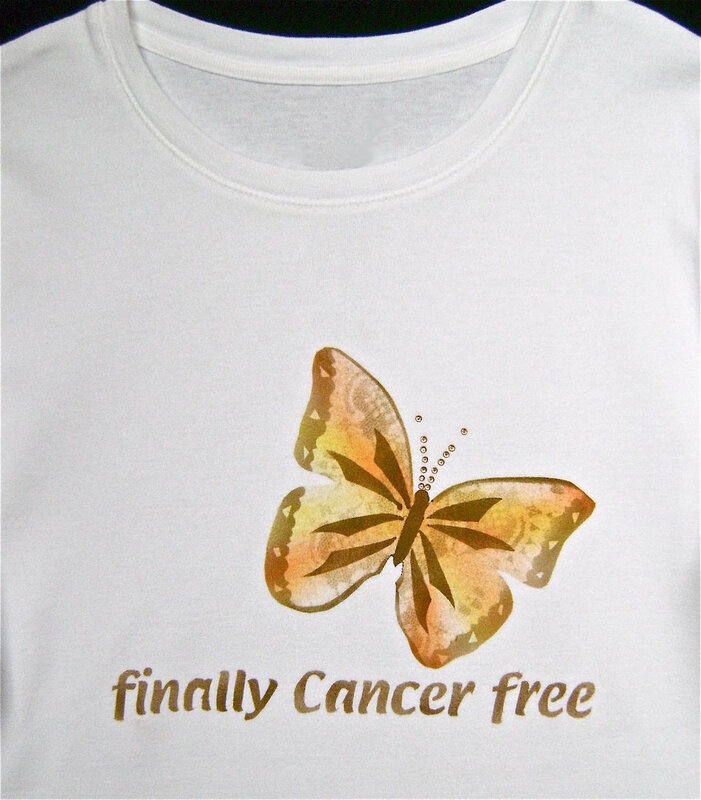 Paint this project for the person in your life who is determined to beat this disease. Tell her to keep it in in her closet, ready to wear when the time is right to announce this message. Paint the butterfly pink or teal or whatever color seems appropriate. This project is recommended for airbrush only. step 2 - Download and print out the stencil on card stock. With a craft knife cut out the butterfly on the red stencil outline. Make one continuous cut. You will be using the cut out piece later so be sure it is not sliced or separated in any way. Set aside. step 3 - Spray the back of the stencil with repositionable adhesive stencil spray. step 4 - Place the stencil on the shirt, aligning the center lines of the stencil and shirt. Press down on the cut edges. step 5 - Paint the open stencil section with streaks of Mango Tango followed by Blonde Ambition paint. Spray diagonally from one outside edge to the other. Try to leave a little white of the shirt showing. step 6 - Trim off the four wing borders “A” from the wing section using decorative craft scissors or pinking shears. Spray adhesive on the back of the four “A” pieces and the single “B” piece. step 7 - Place the “B” section inside the stencil to protect the wings during the next step. step 8 - With regular scissors, cut a few tiny odd shapes from painter’s tape and adhere them to the exposed wing borders. Paint the borders with a light spray of Bronze Have More Fun paint. step 9 - When dry, you will create a Bronze outline at the top and bottom of the wings by positioning the “B” section about a quarter of an inch away from the stencil. Spray the space with the Bronze Have More Fun paint. Repeat at the wing bottoms. step 10 - Set aside section “B”. Put the four section “A”s back in place. Position a decorative stencil or lace over one wing after applying adhesive to the back. Spray with Bronze Have More Fun paint to create designs inside the wings. Repeat on the other wing. step 11 - Place the “B” section on the cutting mat and cut out all the grey areas which will separate the wings. Return the two “B” pieces to the dry shirt and press in place. Spray with a rich coat of Bronze Have More Fun paint. step 12 - When dry, carefully remove all the pieces. Use the point of a craft knife to lift up the tiny pieces of painters tape. step 13 - Cut the black areas of the lettering out of the stencil. Adhere to shirt and spray with Bronze Have More Fun Paint. step 14 - Create antennae with a few hot fix rhinestones. Adhere with an iron or rhinestone applicator after 24 hours. For best results when cutting out letters, do not remove the tip of the knife from the card stock to work around corners and curves. Instead, hold the tip down and pivot the paper to work around curves and angles. My decorative scissors were from Fiskars and called “Majestic”.